By nature, talking over course material promotes active learning. 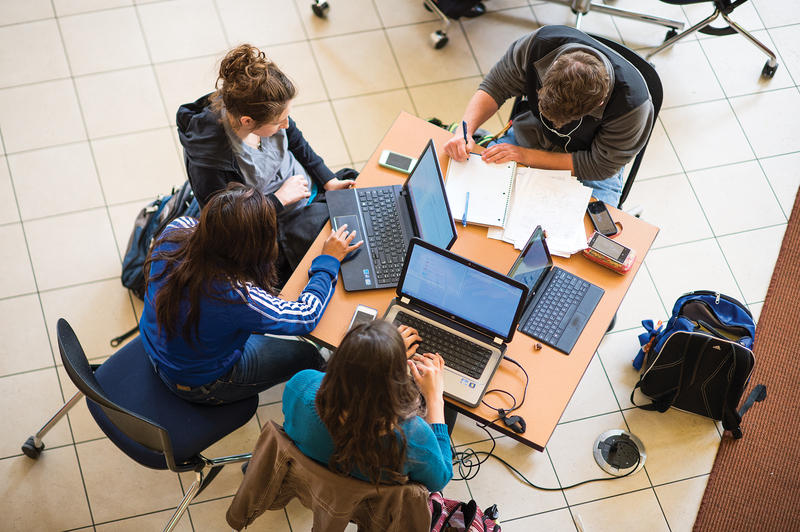 Some students shy away from studying with other people, because often study sessions deteriorate into “gripe” sessions about the course or certain members of the group do not contribute to the understanding of information. However, these distractions can be avoided with some study group “ground rules” that develop a habit for effective group work. Students who develop strong team working relationships with other students in their classes often report more motivation toward studying, less stress related to the course with this support system, and a better understanding of the material (University of Illinois–Chicago, 2008). There are several types of study groups. Some groups simply get together prior to exams to go over the material. While this exercise can be helpful, typically these are not the type of study groups that actually promote long-term learning and social support. The most effective types of study groups tend to meet regularly—weekly or every couple of weeks—to work on homework problems, compare lecture notes, discuss current assigned readings, and create cram cards or other study tools that will aid later group review for an exam. Conduct a Post-Test Analysis for one of your exams by answering and reflecting on these relevant questions. It is best if you can complete this analysis prior to receiving your grade for the exam, but if you have already received a grade try to think about how you felt about the test before getting it back. How much time did you spend preparing for this exam? Approximately what percentage of the assigned reading did you read? Did you use your notes for the test? Did you review the handouts given in class before the test? If you studied with others, rate how effective the study sessions were on a scale of 1-10. What types of questions did you tend to miss more? What were the topics of content? Do you now understand the correct answer? Do you see any patterns in the types of mistakes that you may have made? Did you tend to second guess yourself and change a correct answer to an incorrect answer? Do you see any patterns in where the test items tended to come from? Mostly from the readings? Mostly from class notes? An even mix between the readings and notes? More from the notes, but some from the readings? From places you would not have thought of like the graphs, photographs, or tables? Was there certain content that you were not as strong in answering correctly? What do you need to do to make sure you understand this material? Do you need to talk with your professor to better understand this material? Based on the answers to some of the questions throughout this assessment, what are you going to do differently next time? Be specific. Getting a strong start with a group of committed students at the beginning of the class is tremendously important. A group with mixed levels of academic expertise can be a very effective group as long as the members are committed to working with the group. Stronger students can benefit from teaching students who may be struggling with the material, while struggling students learn study strategies as well as the material the group is reviewing. Consider “Tips for Effective Study Groups” as you move forward with developing study groups. Establish a study group with 2–4 other committed students in your class. Exchange contact information with those participants. You may begin a conversation with students who attend class regularly, take notes, sit toward the front, and appear to pay attention in class. You may ask the professor to help you identify other committed students that you can recruit. Set a regular time and place to meet. Meet in a public place like the library, empty classroom, residence hall study room, cafeteria, etc. At the first session, decide on the rules that your group will agree to adhere to in order to promote teamwork and accountability. For instance, some groups determine that if a member does not prepare for a session that they cannot stay to learn from the others. Some groups set a routine in which they study for 50 minutes and then spend ten minutes “blowing off steam” and problem solving (with a timekeeper keeping it limited to ten minutes). Set study goals for each session regarding what material you want to cover or what activities you want to perform as a group. Establish a “monitor” for a given session to watch the time, record notes for the group, and make sure that everyone is participating. This duty can be rotated throughout the group and may even become obsolete once a strong working team has been established. Make sure that everyone participates actively. Take turns presenting sections of lecture notes or readings, take turns taking a group through the solution of a problem, take turns asking each other questions and having others answer them, etc. Share study tools developed, summaries of topics, visual organizers, etc. Write down any questions that one or two group members can approach the professor or graduate assistant for help and then share with the group at the next session or via e-mail. At the end of the study session, establish what material you are going to focus on so that everyone in the group can prepare for the next session. Adapted from Dembo & Seli (2008) and University of Illinois–Chicago (2008).